Steps up from the pool lead to a raised terrace. The front door opens into an open plan sitting room and dining/kitchen area. There is also a full bathroom on this level. Patio doors from the sitting room and kitchen open onto a large balcony which overlooks pool. Upstairs there are 2 bedrooms (1 double and 1 twin), each with their own access to the front balcony. There is also a large family bathroom. The ground floor, via a separate entrance, opens into a self contained apartment with lounge/kitchen, 2 bedrooms (1 double and 1 twin) and bathroom. Theo Beach Villa can sleep up to 8 people. The villa is perfect located near to the beach and the taverna. We loved the quietness and the seclusion. A good starting point to go hiking. It was a great holiday in the villa. Great location, quiet and relaxing and yet the tavernas, beach and supermarket were all a short walk away. Will definitely go back someday! Beautiful, well equipped house, good service and cleaning, great location! Good restaurant too! Could easily be marketed as the best taverna in the area. We wouldnt mind coming back someday. A great villa for a large family. We had such fun in the pool and eating at the huge table under the Veranda with a sea view. The magnificent mountain views are unreal and unforgettable from the balconies and pool. The villa is very well equipped for dining in which we did often. 17 days of bliss. On the whole we had a fantastic holiday in Crete. Spiros and his family and staff were very welcoming and the shop owners in particular were very very helpful to us. 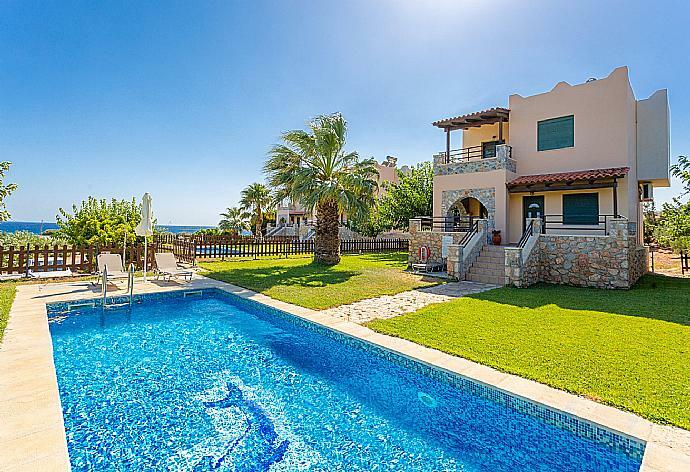 A beautiful and large villa near the beach in a quiet area of Crete. Everything was great we had a nice and relaxing holiday. Thank you very much. Loved it! If you are looking for a remote, low key, private experience, this is the place! Groceries, toiletries, and beach supplies available down the street at a small shop just a ten minute walk away. We loved the restaurant, which was only a two minute walk away. Best food ever! We ate tzatziki everyday. We rented the Theo Beach villa with 6 adults and one baby and had room for two more adults. Nice sand beach, also two minute walk away. The location is beautiful, mountains to the north, Mediterranean Sea to the south. We also hiked down the shore, past the beach (need tennis shoes or hiking sandals), tall cliffs, crashing waves, mountain view, it's breath taking! We stayed four nights and had tons of fun in the villa as well. The pool is great, plenty of grass, chairs, balconies, outdoor tables, and grill. The brothers who own the villas and restaurant are so nice and accommodating!!! Highly recommended! We booked the villa for the second time now together with friends. We greatly value the hospitality and kindness of Spiros and his team especially his very tasty and excellent food at his taverna. We would love to come back! Everything arranged by Agni travel was without fault and they couldn't have been more helpful with the bookings. Our family holiday was perfect and will long be remembered as one of the best. The villa was everything and more than we had hoped it would be. I wouldn't hesitate to recommend Agni travel. Perfect holiday in perfect surroundings. Pleasant, peaceful place in the middle of beautiful nature. Excellent taverna was the icing on the cake. All in all a thoroughly enjoyable accommodation - quiet in a great unspoiled area and with lovely mountain and sea views. The AC was very appreciated, the beds were comfortable with plenty of hot water. Outside we enjoyed the pool, the sun-loungers and the umbrella. To have the sea with lots of beaches and tavernas so close-by was fantastic. Thank you for a memorable stay. We were two families staying at Theo Beach Villa and we all had a fantastic holiday. The villa was of high standard and was very well equipped for 8 of us (which included a 4 year old and an eight year old) and was made even better with having two separate living quarters (two kitchen two living areas etc). The outside space was fantastic and made better with the superb mountain and sea views. The location of the Villa was ideal with well stocked supermarkets close by (some within walking distance and some a quick drive in the car) and an excellent Taverna with great food which was priced reasonably at the end of the villa drive which was right next to a fantastic beach which had crystal clear waters and was excellent for snorkelling and had lovely sandy parts and was very quiet and peaceful. There were also quite a few more Tavernas in the area which could be reached to by walking or a quick drive in the car. 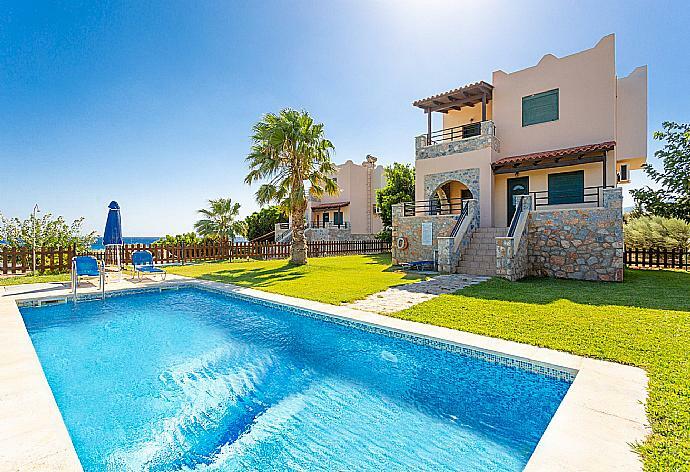 The whole holiday was fantastic and the Villa and surrounding area meet all our parties needs and was made more special by being in such a stunning part of Crete. The Villa was in excellent condition and the few minor issues we did have were resolved straight away after being reported. We will go to Crete next year again and will contact you end of the year. Many thanks for all. The villa is a wonderful place for bigger groups. We had a very quiet and relaxing holiday. The food at the de tavern was very good and we ate there almost every night. 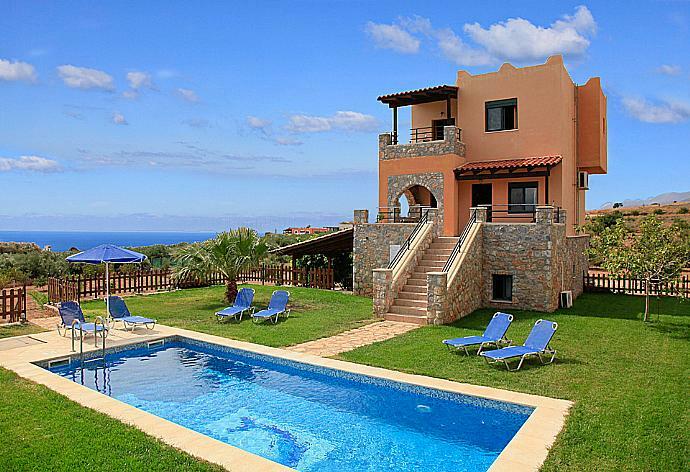 Good value villa in convenient location on unspoilt side of Crete. People generally friendly and helpful and tavernas offered pleasant food at reasonable prices. lovely place lovely peopleSpiros family are so genuinely friendly and helpful.Best food on crete at their taverna.We all enjoyed our stay.Thankyou.